‘Tableware as sensorial stimuli’ is de titel van een intrigerend project dat je momenteel kunt zien in Galerie Judy Straten, Horst. Vijf merkwaardig uitgevoerde lepels en variaties daarop, kijken ons verwachtingsvol aan. Jinhyun Jeon wil met deze vormen de relatie onderzoeken tussen kleur, vorm, gewicht, textuur en smaak van bestek. Een heel verheven doelstelling, waar hij ook behoorlijk ver in gaat. Het is een boeiend project – op de rand van kunst en (toegapaste) wetenschap. Heel verheven allemaal en ik plak hierachter ook de Engelse uiteenzetting die ik over dit project heb gevonden. Maar als je de bijbehorende foto’s bekijkt, die Jeon bij zijn project levert, voel je dat er onder het ene project een tweede hangt. Niks mis mee. Het een kan de legitimatie van het ander zijn. En toch is het me allemaal net te eh… voor de hand liggend in zijn uitwerking. Want wat was het (visuele) effect geweest als Jeon behalve vrouwelijke modellen ook mannen had genomen, eventueel zelfs kinderen? Ik had het graag gezien – en het waarschijnlijk ook spannender gevonden. De vraag komt eigenlijk steeds dringender op waarom in godsnaam die hele semi-wetenschappelijke verantwoording nodig is, als de uitwerking eigenlijk vooral plaatsvindt in het feminieme sexistische domein. Moet je mij horen! Nouja, het is wat het is. Leuk idee, mooie plaatjes, geil zelfs. Maar in zijn uitwerking eh… eigenlijk te steriel. Tableware as Sensorial Stimuli by Jin Hyun Jeon is a project about color, shape, weight, texture and taste, that stimulate all your senses! Cutlery design focuses on getting food in bite-sized morsels from the plate to the mouth, but it could do so much more. This project aims to reveal just how much more, stretching the limits of what tableware can do. The tableware we use for eating should not just be a tool for placing food in our mouth, but it should become extensions of our body, challenging our senses even in the moment when the food is still on its way to being consumed. Focusing on ways of making eating a much richer experience, Jin Hyun Jeon created a series different cutlery designs, inspired by the phenomenon of synesthesia. This is a neurological condition where stimulus to one sense can affect one or more of the other senses. Taste is created as a combination of more than five senses. Tasty formulas with the 5 elements – temperature, color, texture, volume/weight, and form – are applied to designs. By exploring synesthesia Jin Hyun Jeon can stretch the borders of what tableware can do, the eating experience can be enriched in a multiple sensory ways. The color, shape, weight and texture of this cutlery will activate all your senses. But Jin Hyun Jeon went above and beyond to explore the senses and found out that temperature is also influencing the taste of the food we eat. Temperature: The temperature influences certain changes to the taste. Sugar starts to taste sweeter at body temperature. Salty taste becomes stronger when the temperature drops. A sour taste will always be a sour taste when the temperature rises or drops. Bitterness decreases as the temperature rises above the body temperature. Tactility: According to ‘Dr. Linda Bartoshuk’ of the Yale University School of Medicine, it is generally known that the tongue map is incorrect. Sweet, sour, salty, and bitter are perceived anywhere there are taste buds. When a strong sweet taste and strong salty taste are mixed, it creates completely new taste. When salty and sour tastes are mixed, both the tastes soften. If the salty and sour tastes are mixed well, a sweet taste can be created. If the sweet taste is stronger than salty taste, the sweet taste becomes stronger. 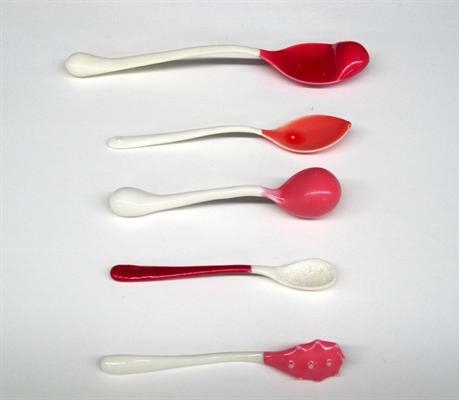 The different types of sensitive tactile spoons could not only stimulate our tongue, but also lips and the palate. The exact effects depend on the level of individual sensibility of our own tongue map. Colors: Colors can increase Appetite when using warm colors, such as red, orange, and yellow. Comparing how sweet tastes between red and yellow with the same level of sugar, the sweetness of the red (crimson, scarlet) colored food tastes stronger than yellow. Orange stimulates the appetite, because orange has been found to increase oxygen supply to the brain, and stimulates mental activity. Yellow increases metabolism so it is a good choice for dishes or tablecloths. However, if all the food and the table are arranged with warm colors, it could decrease the appetite. The warm colors are most effective when used in small amount to create highlights. able to feel the weight of food, making us more aware of the amounts of food that we’re eating. people. Changing the thickness of the handle can create more awareness when eating. Small amounts of food can become heavy or big amounts of food increase awareness about the consuming moment.